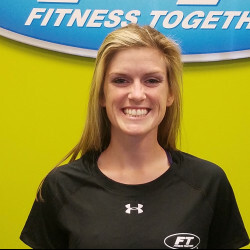 Get to know our friendly Fitness Together® Personal Training Staff at Rancho Bernardo. 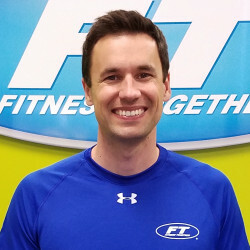 Charlie has been with Fitness Together in Rancho Bernardo for over 11 years, and took over ownership of the studio in June of 2013. He graduated with a Bachelors degree in Physical Education from Biola University. He grew up with a love of sports and fitness, and played baseball for 4 years while in college. After graduating, Charlie became certified as a personal trainer through the National Council on Strength and Fitness. He has also obtained a Precision Nutrition Level 1 Certification in Exercise Nutrition to help educate clients on the importance of healthy behaviors and habits when it comes to their eating. Charlie enjoys giving support and encouragement to all clients who come to FT looking for a private atmosphere to help them improve their well-being, especially for those who are uncomfortable with the typical gym setting and want a more personal experience. The main focus for Charlie and the training staff is to provide the accountability and motivation that is necessary for clients who want to make significant lifestyle changes. Charlie hopes that everyone's experience at FT-RB is fun, challenging, encouraging, educational, and most of all... rewarding! Candice has over thirteen years in the fitness industry as a personal trainer, nutrition coach, and academic instructor. She just recently moved to San Diego from Dallas, TX, and has loved every minute so far. She graduated with her M.S. Degree in Human Movement and her B.S. degree in Kinesiology. Candice has a love of learning and continues to expand her knowledge in the health and fitness field through various certifications including National Academy of Sports Medicine, Titleist Performance Institute Level 2, Precision Nutrition, Postural Restoration, Kettlebell Athletics Level 2, TRX Suspension Training, Metabolic Flexibility and Conditioning. She has experience working with a wide variety of clients including post-rehabilitation, golf and tennis sports performance, body composition transformation, youth fitness, and health maximization. Candice believes in striving for progress, not perfection. She encourages her clients to be a little bit better each day! By applying a holistic approach to her fitness programs, she incorporates not only movement practice but also nutrition and recovery based strategies. Through detailed assessments and progressive programming, she can help you reach your ultimate goal, whether it is body composition transformation, sports performance, or longevity and vitality! Candice applies similar principles in her own life as she enjoys strength training, hiking, and yoga to maintain a balanced mind, body and spirit. Kim graduated as a student-athlete from Cal State Fullerton University, where she majored in Kinesiology with emphasis in health and fitness. There, she competed in cross country and track at the NCAA Division 1 level. After college she worked as a strength and conditioning coach for sports teams like softball, track, and swim along with individuals looking to better their overall strength, agility, and speed. She also works as a fitness instructor at MCRD teaching cycling, core, and boot-camp classes to those looking for a happier, healthier lifestyle. 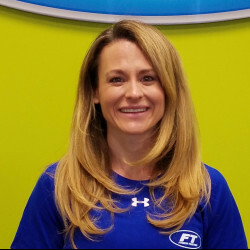 Aside from an athletic background, she has experience in a physical therapy environment working to rehabilitate a wide range of individuals recovering from an operation or looking to strengthen muscles to prevent injuries. She is also currently studying to become an NSCA Certified Strength and Conditioning Specialist. Kim enjoys long distance running and strength training herself. She uses her motivating attitude towards life to help her clients push themselves in reaching their goals to get stronger, fitter, and healthier. Anthony graduated UC San Diego with a Bachelor of Science in Physiology and Neuroscience in 2013 and recently received a Masters of Science in Kinesiology with an emphasis in Sports Performance from Point Loma Nazarene University in 2018. He was a four year letter winner in both Cross Country and Track and Field at UC San Diego. 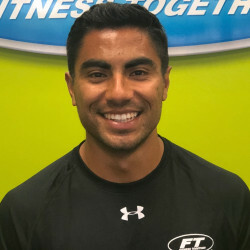 Anthony has over 5 years of coaching experience as a running coach for a wide variety of clients at various levels from youth to masters and is a level 2 certified endurance coach through United States Track and Field Association. He has a very diverse background of training experience with years as a physical therapy aide as well as stints at sports performance clinics in San Diego. Anthony is currently the assistant coach for Cross Country/Track & Field at Cal State San Marcos. When he is not coaching you can find Anthony competing for boom Running Club, a local club with various post collegiate athletes, racing various distances from half marathon down to the mile. Anthony’s training philosophy is rooted in sharpening the fundamentals of fitness to provide a stable platform for growth and success. His approach is best characterized as “scientifically based but client driven”. Anthony believes that the key to maximizing an client’s potential is to understand and cater to their individuality. The science behind training is merely a set of guidelines that helps direct a coach and client towards reaching their goals.